COMMENTS: Very good packaging and sturdy. I will repurchase. COMMENTS: I love the heat seal stand up pouches. They are great for odd shape bath fizzies, powders, and so on. COMMENTS: This bag is really easy to fill and shows my products beautifully. It stands without tipping over and it is resealable. "Heat Seal Zip Pouch: 16 oz. Clear & Silver"
COMMENTS: Bigger than expected.Perfect for bath salts & milk bath. I love that you can see the product because of it being clear in the front. COMMENTS: Easy to fill, stand on their own, look professional, look great with a label on the front or back.. These are perfect. The price is good, and customers love being able to clearly see the product inside. I use these for shower steamers, I fit 9 per bag and they look great in this bag!! "They do stand up "
"Heat Seal Zip Pouch Clear & Silver"
COMMENTS: Love this heat seal bag. It looks very up beat with soy wax tarts, bath bombs, bath salts and shower steamers in. I would recommend this bag for all of your needs. COMMENTS: These pouches are great. COMMENTS: Perfect for storing bath salts! I use my impulse sealer to seal it at the top. COMMENTS: use these for bath bomb minis. They are perfect!! "16 oz Heat Seal Pouch"
COMMENTS: Holds product well. Stands up nicely. Looks good on the shelf. "16 oz clear and silver heat seal pouch"
COMMENTS: This heat seal pouch is clear on one side so that your product can easily be seen. The other side is a foil silver color. Very professional looking. Easy to seal with a flat iron. Depends on what product you put in it as to how many ounces it will hold. COMMENTS: Perfectly adequate product that fulfills its purpose. "Packaging pulls product together professionally "
COMMENTS: Totally in love with these bags. Makes the product look professional and packages easy. Will definitely be buying more. COMMENTS: Makes my laundry Detergent look very professional and super simple to use! "Quality is good but not accurate description!" COMMENTS: I will hold 16 oz. of some recipes but not everything. I tried to heat seal one but the zipper gave way and my sugar scrub went everywhere. When I tried to return them it became a nightmare. COMMENTS: Perfect for packaging salts. The plastic is not cheap either - nice quality ! COMMENTS: I ordered only 2 of these to test my powdered products. This 16 oz pouch holds at least 9oz of my dry product with a little room at the top. Used a warm iron to seal and my customer loved the new packaging. Will order more. Thanks WSP!!! "Great for bath salts or aroma crystals "
COMMENTS: These are so pretty and professional looking! I bought them for the aroma crystal recipe and love them so much for that. I am also adding it to my packaging for customers that order 16 oz bath salts. The heat and seal works great on these. 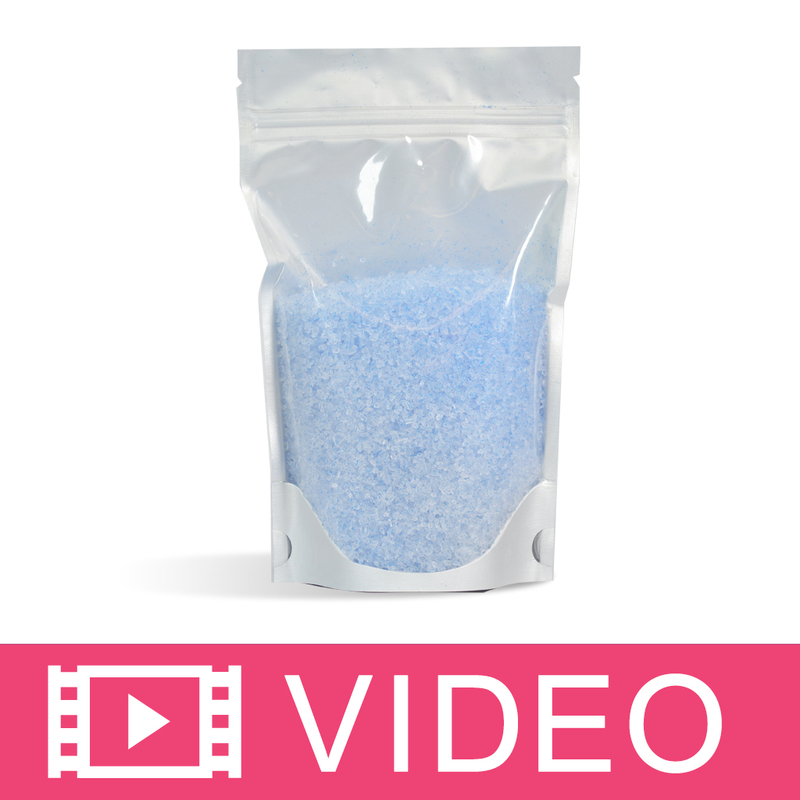 COMMENTS: These bags are great for packaging aroma crystals, especially if they are colored. I made Cobalt Beach Glass with blue glitter, Coconut & Lime with green mica, and Icy Peppermint with ruby red glitter. They look spectacular, and my house smells wonderful. But I smelled them all weekend so by Sunday night it was hard to tell how much fragrance remained. I shouldn't have worried. I took samples to work Monday, and the response was very gratifying. The peppermint one was easily recognized, as was the coconut lime, but the Cobalt Beach Glass (which seemed faint to me) was a big hit with just about everyone. Most comments were about how fresh it smelled. These bags will easily hold 16 ounces of Aroma Crystals, and they stand up nicely. If you want/need to store the filled packages but need for them to be flat, only add 8-10 ounces of product and squeeze out any air. I think these bags would be very versatile in that they could be used for any number of different products, especially bath salts, sugar scrub cubes, and candles. COMMENTS: This product is AMAZING. The the ability to seal them is perfect for our bath salts. This feature allows me to keep the scent in. I also think the clear front and silver back are great for presentation. I would strongly recommend this product. COMMENTS: I like this little heat seal packages because my customers know they haven't been tampered with when I seal them. I also like that I can put bath salts and facial masks in these very easily. I enjoy using these bags. COMMENTS: Love these for my bath salts. So easy to fill and seal. Also love the fact that customers can open, use what they need and re-seal! COMMENTS: These bags are beautiful. They hold about 16-20 ounces of the European Spa Salts (Medium). The window is just big enough for a pop of color, against the white backdrop the result is nothing short of professional. Thanks WSP for offering such high quality products for small entities like me. COMMENTS: I use these for bath salts. They are easy to seal, look good on display and are a nice size. COMMENTS: I've tried the rest and come back for the best! COMMENTS: The clear and silver pouch is amazing! I purchased a couple to sample for bath salts and facial masks. The bottom is stable and does not need support when filling the pouch. The finished product looks so elegant and professional in the pouch. I packaged bath confetti and can't wait to hear what my customers think. COMMENTS: I didn't think I would like them and that is why I wanted so long to use them, finally inspiration hit me, and I decided to make homemade washing powder and use these little bags. I love them so much I am ordering more. You give customers the added benefits knowing that they item is safe, because it is heat sealed, tamper proof, and customer gets to see their product. I wish they came in bigger sizes. COMMENTS: I started using this pouch about a year ago for my bath salts and it gives my product a professional look! I love these!! COMMENTS: Use these for sugar cubes, and they are great! Look expensive! COMMENTS: Because these are seal-able, product stays fresh. We use them for facial mask blends and bath salt blends. COMMENTS: Excellent quality and truly one of the best prices around. I have reordered many times and will continue to do so. Great product! COMMENTS: I use these with all of my bath salts. COMMENTS: I used jars for my bath salts until I found these heat seal pouches. I love the fact that they fold flat(great for storage), the seal is perfect. It give my customers peace of mind that the product hasn't been tampered with. COMMENTS: These pouches add the finishing touch to my product. They look great. "Heat Seal Zip Pouch 16 oz Clear and Silver"
COMMENTS: These are the perfect size for my new bath salts. I ordered a small amount at first to see if I would like them, then ordered more. I hope to keep these in stock. My label looks great on them. "Having Options is a Great Thing"
COMMENTS: I found these awesome heat-seal bags in the nick of time because I as having problems with packaging my bath salts in glass jars. First, they were too heavy and, second, they did not keep the humidity out and the salts got "hard". These great bags are the perfect size, keep moisture out of the salts, look really professional, and are not heavy to carry and/or mail. The only issue I had was that a couple of them "expanded" after they were heat sealed so you have to make sure all of the air is completely out before you seal them. COMMENTS: I use these for my bath salts and they work great. They hold about 20 oz of the course grain spa salts. "SO STURDY AND SPA LIKE"
COMMENTS: These are so functional and are such a nice alternative for jars. • larger for SPECIAL PROMOTIONS !!! 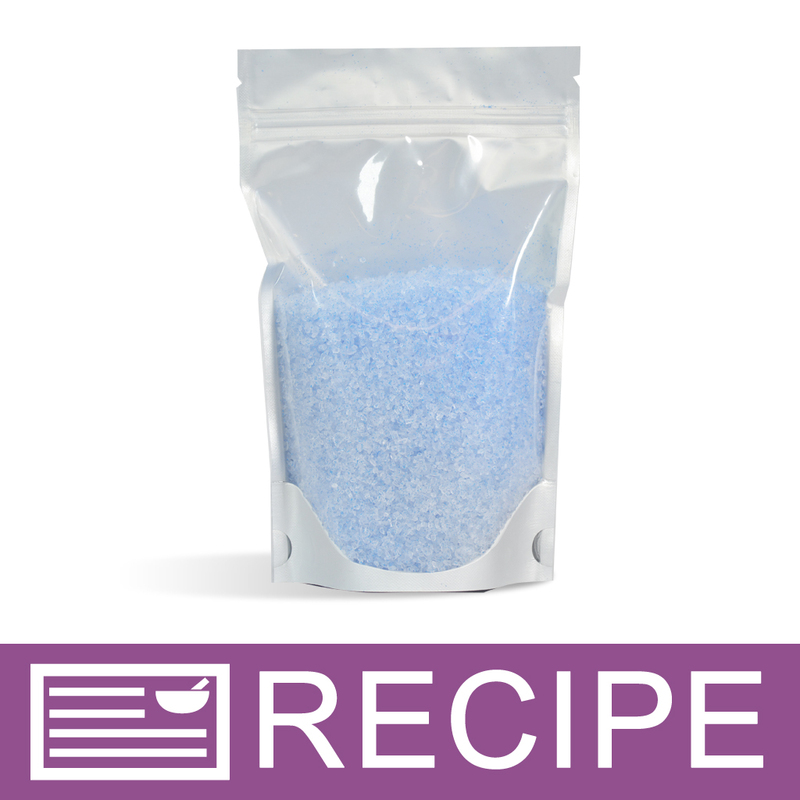 COMMENTS: These bags are GREAT for displaying and selling bath salts at craft malls, fairs, etc. They will hold over 12oz of salt.... 8oz almost looks half empty! Great professional image. COMMENTS: These seal really nicely with a home iron. Will be back for more! COMMENTS: Excellent for bath salts. Not only do they look very nice, they keep shipping prices very low. COMMENTS: These bags are amazing. They are the perfect size for my larger size of bath salts. And they stand up on their own, which makes them so much easier to use. The clear side allows a nice view of the salts inside so customers know exactly what they are getting without opening it up. COMMENTS: Love these for packaging bath salts. I bought a curling iron/hair straightener to seal the top with (use low setting). This works better for me than an iron because I can have it handy on my packaging table. COMMENTS: I was using a 16 oz jar for my bath salts and switched to these and LOVE them, as do our customers. Very sturdy and very clear. COMMENTS: I use to give out samples of scrubs and masks. They also make the perfect size to take several when traveling. It is a great way to introduce your products without investing in expensive packaging for something that may not be a hit. Nice size to slip a sample in with a gift set too. Nice sturdy package. • Just right for samples! COMMENTS: Love these for bath fizzies. It keeps them fresh and nicely sealed. COMMENTS: I use these zip pouches for my foaming bath milk. I will always use these! COMMENTS: I use these for natural dishwasher detergent and they make my product look professional. I will also plan to use these for bath salts. Very happy with purchase. COMMENTS: I LOVE THESE ZIP POUCHES, REALLY EASY TO USE, KEEPS MY BATH SALTS FROM DRAWING MOISTURE, GREAT WAY TO PACKAGE MY BATH SALTS, VERY PROFESSIONAL. "Perfect size, easy to use"
COMMENTS: I purchased these bags for my bath salts and they look great in them - easy to store, fill, seal, and display. Very reasonable price, too. COMMENTS: Nice bag. Holds 16 oz well. Would like it to be clear instead of the silver backing. COMMENTS: I use these for my laundry detergent and salt/sugar scrubs. Plenty of room for the product and scoop. My daughter loves sealing the bags. Very professional looking. "16oz Heat and Seal bags"
COMMENTS: These bags are great for my customers to see what is inside. Holds 16 oz of my bath salt blend and seal easy. "Use as a refill bag"
COMMENTS: I love this bag, has really helped me sell refill products! My iron has to be on a med/hot setting to get the bag to seal, but other then that I works great. COMMENTS: I use these great stand up bags mostly for my herbal tea blends and tea bags. They are perfect for displaying and stand up very well! I love the seal on these and highly recommend them for loose tea and bath salts. COMMENTS: I don't know why, but I am overly amused by these bags. They do a quick job of making my things look professional. Bought them to make the Christmas cookies that I give to friends and family look nicer and I'm so anxious to use them. I heat sealed them with my flat iron and it worked like a charm. COMMENTS: These are awesome for storing bath bombs, soaks and even laundry detergent! COMMENTS: These are so wonderful for stories my bath tea bags, bath salts, etc! COMMENTS: love this for laundry suds! customers can see the product through the window and it looks very professional. great size too! "Bought them last year...using them now!" COMMENTS: Found the perfect fizzy bath salt recipe to use these bags! Include a scoop...I'm sure these are going to fly off the shelf! COMMENTS: Perfect to seal up the laundry detergent for customers. Love the clear side, though not totally necessary. Tried these out to hold automatic dishwashing detergent I make for the shop & I had problems with the caustic ingredients used eating through the bag. Wished WSP offered Kraft sealable pouches with a gas vent. COMMENTS: These are perfect size! I will be packaging my solid soap scrub in these! COMMENTS: I don't use an iron to seal these bags, I use a flat, ceramic hair straightener. Works like a dream and is easier to handle than an iron...you don't have to tip the bag. I also love how durable these bags are. COMMENTS: i used thes bags for a great granola recipe i have & they look very professional. i like this size & the 2oz. please keep this in stock. COMMENTS: I love this bag for my bath salts! It easily holds a pound and you can see the color through the clear side. Very easy to seal as well! COMMENTS: You have to keep these around. They hold a pound of bath salts, also use them for crystal potpourri the stand nicely and the window is great! "Can this bag safely hold products containing essential oils without degrading and melting the plastic? " Staff Answer As long as the percentage of essential is not too high, it should not degrade the bag. It is always best to test your product and packaging for compatibility. "Will this pouch hold the 5" x 3.75" bath tea bag?" "What size product label is recommended?" "Have you had any issues with the bags having a lot of air pressure inside after adding bath salts? Half of my bags expanded to the point of almost popping after adding the salts and letting them sit for a day. I used epsom, sea salt and baking soda with lavender EO. " Staff Answer We have not had any issues like this. My guess would be that the baking soda is reacting to the Essential oil and expanding after being packaged. You may need to let your salt mixture rest for 24-48 hours to ensure any reaction takes place before packaging. "Could these be used for the shower tabs in the kits you sell?" These types of bags would be great for those! I recommend getting a small size though, depending on how big you want your bath tabs. "In the product picture above this 16oz bag is holding pink salts- do you have any idea approximately how much (cups or ounces) salt is inside? That's as full as I want my bags, so I'm curious just how much it is. Thank you!!" Staff Answer This bag should hold about 8 oz. of product when filled half full. "This product holds 16oz of product? I only ask because the description on the 1oz bag states it hold about 3oz of product. " Staff Answer This bag holds approximately 12-16oz. These are the perfect size for my 1 lb bath salts, but this will vary depending on your product density. "Can this bag be used to store liquid? With no leaking? Looking for a way to ship liquid safely..."
Staff Answer When properly sealed, this bag can be used to store liquid. When shipping, be sure to pack the box well so that pressure does not cause the bag to burst. "Is there an approximation of how many cups these would hold?" Staff Answer Hello Jessica, Thank you for your question. This zip pouch will hold approximately 2 cups, or 16 fluid ounces of product. Please feel free to contact customer service for further assistance.